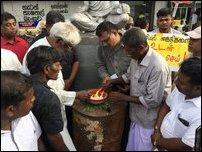 The protest gains momentum following the recent imprisonment of popular Mridangam artist Kannathasan Kanesasundaram, a lecturer at the Arts faculty of the University of Jaffna. Kannathasan was formerly the director of Tamil Eelam College of Fine Arts during the times of the LTTE. Almost all of his colleagues were subjected to genocidal annihilation during and in the aftermath of the genocidal war on Vanni. 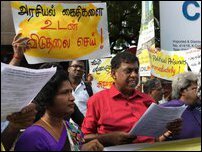 After being released from the prolonged custody and ‘military rehabilitation’ of the occupying SL military, Mr Kannathasan was again targeted through the SL judiciary with an alleged accusation from the past of forced recruitment to the LTTE in 2008. 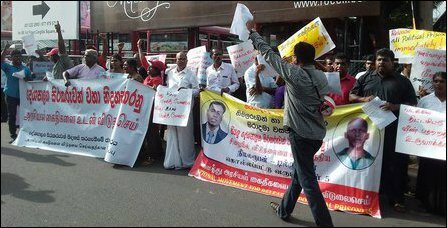 While escaping international investigations on genocide the occupying with the abetment of global powers, the occupying Colombo is determined to treat all the Eezham Tamils who have stood up for the rights in the past as criminal suspects. 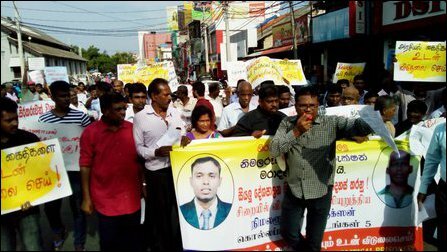 The latest protest also gains significance as 30-year-old Eezham Tamil political prisoner Sulaxan Mathiyarasan, who has been detained in various prisons without trial for more than 8 years, is set to re-launch a continuous hunger-strike on 20th August at Anuradhapura prison. In the meantime, Colombo has let lose its STF commandos and SL military operating in the background, carrying out new round-ups and arrests targeting the new generation of Tamil youth under the cover of controlling gang violence. 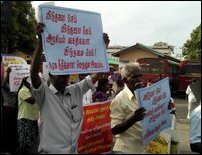 The protesters condemned renewed arrests and harassments threatening the security of Eezham Tamils in the peninsula. 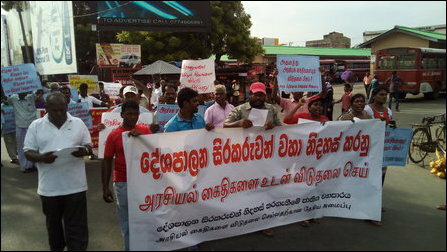 Meanwhile, Sinhala police and prison officials in the prisons of Colombo are trying to deceive some of the Tamil political prisoners to testify against their inmates as part of a drive by the SL Attorney General's Department to transfer the cases of Tamil political prisoners to the courts in South. Informed legal sources in Vavuniyaa said Vavuniyaa High Court Judge was under heavy pressure from Colombo on the case of Kannathasan as well as in the drive of transferring the cases to the courts in South.